Glover was credited with 18.5 sacks in college and was selected by the Oakland Raiders in the fifth round of the 1996 NFL draft. He saw action in only two games as a rookie and played with the Barcelona Dragons of the WLAF in the Spring of 1997. 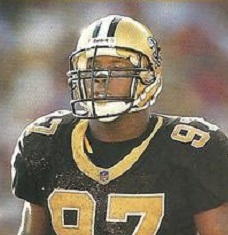 Waived by the Raiders during the preseason in ’97, the Saints picked Glover up and he recorded 6.5 sacks as a backup before moving into the starting lineup and compiling 10 sacks in 1998 and 8.5 in ’99. The arrival of DT Norman Hand allowed the Saints to take better advantage of Glover’s speed and strength as a pass rusher. Saints went 10-6 to finish first in the NFC West while leading the NFL in sacks (66). Won NFC Wild Card playoff over St. Louis Rams (31-28). Lost NFC Divisional playoff to Minnesota Vikings (34-16). Glover followed up with 8 sacks and another Pro Bowl selection in 2001 before departing for Dallas as a free agent. A disruptive player with surprising speed who was also good against the run, he received first-team All-NFL honors from the Pro Football Writers and Sporting News in 2002 and was a second-team choice of the Associated Press in both 2002 and ’03. Glover was a Pro Bowl pick in each of his four seasons with the Cowboys, although he was less effective as a nose tackle with the shift to a 3-4 defense in 2005. Released by Dallas, he spent the last three years of his career with the St. Louis Rams, through 2008, before retiring. In all, Glover compiled 83.5 sacks, 50 while he was with New Orleans. He was a consensus first-team All-NFL selection twice and was selected to six Pro Bowls.